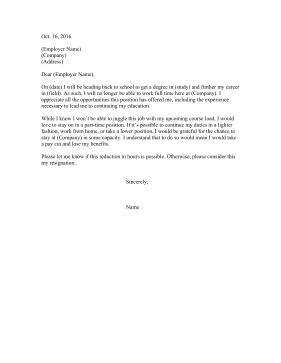 If you need to spend less time at your job due to scheduling conflicts, this resignation letter can serve as a formal request. On (date) I will be heading back to school to get a degree in (study) and further my career in (field). As such, I will no longer be able to work full time here at (Company). I appreciate all the opportunities this position has offered me, including the experience necessary to lead me to continuing my education. While I know I won't be able to juggle this job with my upcoming course load, I would love to stay on in a part-time position. If it's possible to continue my duties in a lighter fashion, work from home, or take a lower position, I would be grateful for the chance to stay at (Company) in some capacity. I understand that to do so would mean I would take a pay cut and lose my benefits. Please let me know if this reduction in hours is possible. Otherwise, please consider this my resignation.